First two fabulous and - important, this! - fun books in what I hope will be a sprawling series of history lessons, excitedly received by those who love works which wink. All education should be entertainment and this balanced both so beautifully that at the end of each I was holding out my begging bowl for more. Instead of feeling like illustrated prose, the Mediterranean-coloured, image-orientated pages read like info-splattered illustration into which is injected the illusion of comics. The illusion of comics! So clever! The illusion's achieved by assigning mischievous môts and satirical side-swipes in speech balloons to the guides, guest-stars and bystanders commentating on the institutions, inventions and initiatives being explored. 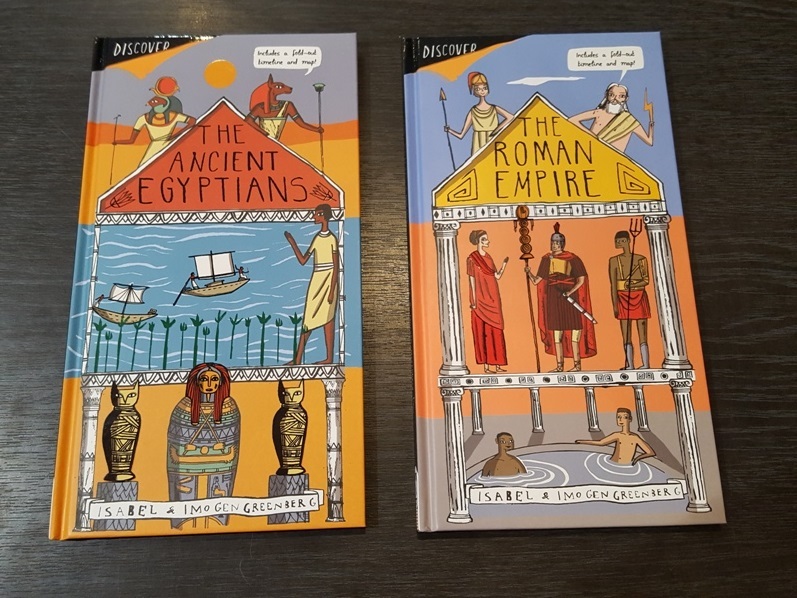 I particularly enjoyed the third and fourth page instructing us on Egyptian gods: Osiris of the underworld, Isis (both his sister and wife - don't try that at home, kids! ), their son Horus of the sky and... oh, there's always one in every family, isn't there? "This is Seth. He's Osiris' brother, and he was the god of chaos... He's trouble!" ... Pants jackal-headed Seth, a barely suppressed smile playing across his mouth. I suspect he knows what's coming next, and I fear "trouble" might be understating it slightly. "Seth brutally murdered his brother Osiris...."
What I did I tell you? Fortunately Isis resurrected Osiris long enough to have that child Horus so that this could all this symbolically represent the death and regrowth of crops which is nice. "I declare you shall be banished, Uncle Seth!" 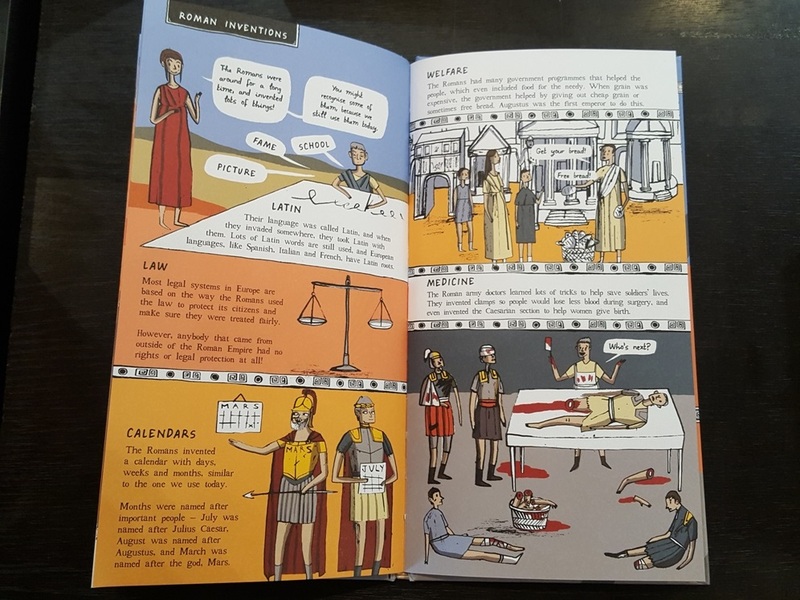 If all this seems so very Lizz Lunney it's actually the result of the Greenberg sisters, Isabel of course being responsible for the enormously playful ENCYCLOPEDIA OF EARLY EARTH which was my favourite graphic novel of its year. It was Epic and Awesome, a story about Stories, but brilliantly it poked fun at itself, the Epic and the Awesome. As to the other tome, did you know that as well as their own gods the Romans were such big-hearted / open-minded / conquest-crazy fickle thieves that they worshipped gods from other countries and religions as well? See Isis above, but also Pan, the Greek god of mountains it says here but also field-friendly discos. Books like these should always surprise and this certainly throws in a few googlies down its timeline. You'd get a Q.I. alarm bell, for example, if you buzzed in with "Emperor Julius Caesar" for he was nothing of the sort. Caesar was a genius general who declared himself dictator only to be ousted before so very long by his adopted son Augustus who did become the first Emperor of Rome. "How sharper than a serpent's tooth" etcetera. Before we return to Ancient Egypt, here's another one: not only did Emperor Constantine (pronounced 'wine', just like the star of HELLBLAZER - they are related!) convert to Christianity, taking much of the empire with him, but he built a new capital to rule from which he called Constantinople. Which was just as well because - believe it or not - the Roman Empire kind of lost Rome in 410 AD to the Visigoths and, umm, never recaptured it! Coming back to how well visual aspects like the River Nile are incorporated and utilised within the page, I loved how the Egyptians' pyramid-shaped, feudal society, is explained within a pyramid. Apposite in every way. Surprises from thereabouts come in the form of our 365-day calendar which they invented (although it fell to the Romans to add the twelve months and seven-day weeks), a three-season year revolving around the condition of the Nile (and therefore the crops), and the surprising news that Upper Egypt was down south and Lower Egypt was oop north because the Nile ran south to north and the Egyptians rulers were all a bunch of elitist Tory bastards. Lastly, the Ankh...? It's a hieroglyph meaning life, not DEATH, which was Neil Gaiman's point all along. So I imagine that's sent a whiplash round what's left of the gothic community.